This guide will demonstrate how to use face detection to extract attributes like gender, age, or pose from a given image. The code snippets in this guide are written in C# using the Face API client library, but the same functionality is available through the REST API. Get the locations and dimensions of faces in an image. Get the locations of various face landmarks (pupils, nose, mouth, and so on) in an image. Guess the gender, age, and emotion, and other attributes of a detected face. This guide assumes you have already constructed a FaceClient object, named faceClient, with a Face subscription key and endpoint URL. From here, you can use the face detection feature by calling either DetectWithUrlAsync (used in this guide) or DetectWithStreamAsync. See the Detect Faces quickstart for C# for instructions on how to set this up. This guide will focus on the specifics of the Detect call—what arguments you can pass and what you can do with the returned data. We recommend only querying for the features you need, as each operation takes additional time to complete. To find faces and get their locations in an image, call the method with the returnFaceId parameter set to true (default). The returned DetectedFace objects can be queried for their unique IDs and a rectangle which gives the pixel coordinates of the face. See FaceRectangle for information on how to parse the location and dimensions of the face. Usually, this rectangle contains the eyes, eyebrows, nose, and mouth; the top of head, ears, and chin are not necessarily included. If you intend to use the face rectangle to crop a complete head or mid-shot portrait (a photo ID type image), you may want to expand the rectangle by a certain margin in each direction. 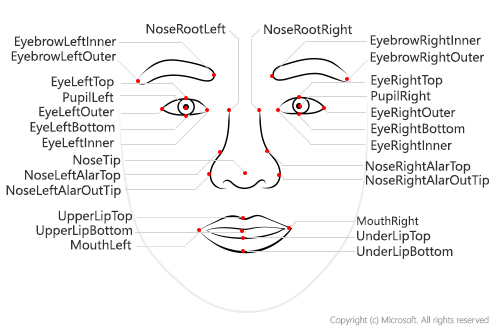 Face landmarks are a set of easy-to-find points on a face such as the pupils or the tip of nose. You can get face landmark data by setting the returnFaceLandmarks parameter to true. Knowing the direction of the face, you can then rotate the rectangular face frame to align it more properly. If you want to crop faces in an image, you can programmatically rotate the image so that the faces always appear upright. These attributes are predicted through the use of statistical algorithms and may not always be accurate. Use caution when making decisions based on attribute data. To analyze face attributes, set the returnFaceAttributes parameter to a list of FaceAttributeType Enum values. Then, get references to the returned data and do further operations according to your needs. To learn more about each of the attributes, refer to the Glossary. In this guide you learned how to use the various functionalities of face detection. Next, see the Glossary for a more detailed look at the face data you've retrieved.